NoviSign’s Digital Signage Software is easy to use and intuitive. The software allows any user, even one with very limited IT experience to create, schedule, broadcast and manage Digital Signage campaigns in just a few steps. The software is designed in ‘layers’ from the very basic image/video campaign, up to complex mixture of image, video, rolling or static text and embedded widgets (such as: clock, RSS and YouTube feeds, shapes, backgrounds, logos and more) providing rich environment for live and dynamic digital campaign. NoviSign Digital Signage offers pre-designed templates. Just insert your content and you’re ready to go! If you do wish to create your own screen, the NoviSign Editor (Creative Composer) is very simple to use with a rich set of feature. Manage your content and posts from any browser, any device and run it on any screen connected to Android / Windows / Chrome OS player. Whether you have one or multiple screens at various locations, NoviSign’s system allows you to update as many screens as you wish from anywhere. NoviSign Digital Signage offers pre-designed templates. Just insert your content and you’re ready to go! If you do wish to create your digital signage content, the NoviSign Digital Signage Software Editor (Creative Composer) is very simple to use with a rich set of drag and drop widgets. Control your screen from anywhere in the world. No technical or design skills required. Dynamic slideshows, RSS feeds, HD videos, weather and more! NoviSign’s interactive digital signage software allows you to integrate Instagram, Facebook, Twitter and other networks into your content to display live & dynamic social media streams from your social feeds. Live social walls for events. Corporate and employee feeds. Chats and messaging boards. You can remotely manage your digital signage content from any browser, at any time and wirelessly send updates to your screen. NoviSign’s digital signage software allows you to update as many screens as you wish from anywhere. Within two minutes of making an update the content updates! Preview your content and playlists before sending it to your screens. Easily access and change content from any device and any location. Preschedule playlists to auto-update on defined dates and times. This video tutorial will show you how to use the basic elements in our digital signage online Studio for uploading your media files, creating your content and sending it to your Chrome OS, Windows and Android players. Q. What is Dynamic Digital Signage? Q. 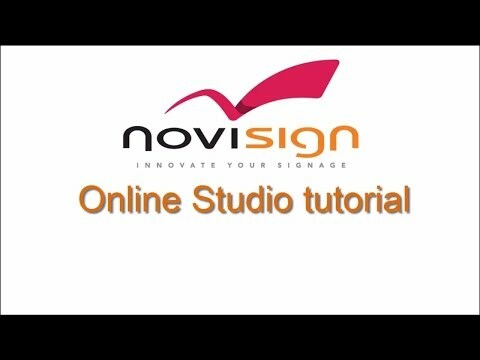 Who can use NoviSign? Any municipality, organization or small business owner can use NoviSign. Our digital signage software is simply the most efficient way to keep people informed, advertise new products and deals and strengthen brand awareness in a physical location. Whether you have one or several screens in a single location or multiple screens at multiple locations, NoviSign keeps it simple and easy to manage. Q. What type of media can I present on the sign? Q. Is NoviSign a digital signage software or hardware company? NoviSign focuses on developing a cloud-based (SaaS) digital signage software platform for digital signage broadcasting. You can use any off-the-shelf hardware to display your signage. Q. What type of video media do you play?